WASHINGTON (CNN) -- The Senate approved a controversial nuclear deal with India on Wednesday, clearing the way for the United States to export nuclear know-how to India after a ban lasting decades. 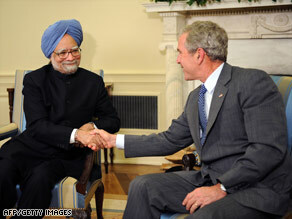 President Bush, who supports the deal, meets with India Prime Minister Manmohan Singh last week. Sen. Chris Dodd, a Connecticut Democrat, said the deal would not only "set the stage for a stronger U.S.-India relationship," but also would promote stability in India's troubled neighborhood. "This agreement is indicative of a new era in Indian foreign policy, an era in which India will see all the world's powers as potential partners in efforts to address its own needs and the needs of others," Dodd said. "I believe that this new era will bring increased stability and progress in South Asia." India and Pakistan have fought several wars since they became independent in 1947, and both countries have tested nuclear weapons. Sen. Tom Harkin, an Iowa Democrat, spoke against what he called flawed legislation before the vote. "If we pass this legislation, we will reward India for flouting the most important arms control agreement in history, the Nuclear Nonproliferation Treaty, and we will gravely undermine our case against hostile nations that seek to do the same," Harkin said. Before he voted against the bill, he said Congress had not debated the legislation properly. "It was hustled through [the House of Representatives] without any hearings and without a vote in the House Foreign Affairs Committee," he said. "Here in the Senate, the Foreign Relations Committee held just one hearing with just one witness who spoke in support of the agreement." Presidential candidates Sen. Barack Obama and Sen. John McCain voted for the bill. President Bush urged the Senate to pass the bill in a statement released before the vote. The bill "represents a major milestone in the transformation of our nation's important relationship with India," the statement said. One senator had anonymously been using parliamentary rules to prevent the bill from coming to a vote, but the leaders of the Senate announced Tuesday night the vote would go ahead. The House of Representatives passed the bill without debate on Saturday. The next step is for Bush to sign it into law. The Indian nuclear market is a rich prize, and the agreement could open the way for U.S. companies to earn billions of dollars building nuclear power plants in India. The French government clinched its own nuclear trade deal with India on Wednesday when President Nicolas Sarkozy signed an agreement in Paris. That puts French companies in the running for some of the same contracts U.S. companies want. In exchange for access to U.S. nuclear technology, India would allow international inspections of its civilian -- but not military -- nuclear power plants. It would also promise not to resume testing of nuclear weapons. The United States banned nuclear trade with India after India exploded a nuclear device in 1974 and refused to sign the Nuclear Nonproliferation Treaty. In an informal agreement between the two nations, the United States said it would halt any nuclear cooperation should India resume testing.